At home do-it-yourself pigs-in-blanket. Great on their own or with a cheese dipping sauce. Wrap one slice of cheese around each hot dog. 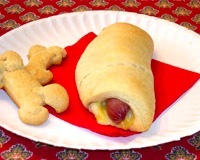 Cut strips of biscuit dough large enough to wrap around the cheese and hot dog. Place wrapped hot dog on cookie sheet with the overlapped dough facing down. Bake in preheated oven until biscuits are golden brown, about 10 or 15 minutes. Time Saver Tip! Make mini dogs! Buy prepared "pigs-in-blanket" appetizers, available in grocery stores. You can usually find them in the frozen foods section. Prepare according to package directions. Serve with ketchup, mustard, honey mustard, or a warm cheese dip.